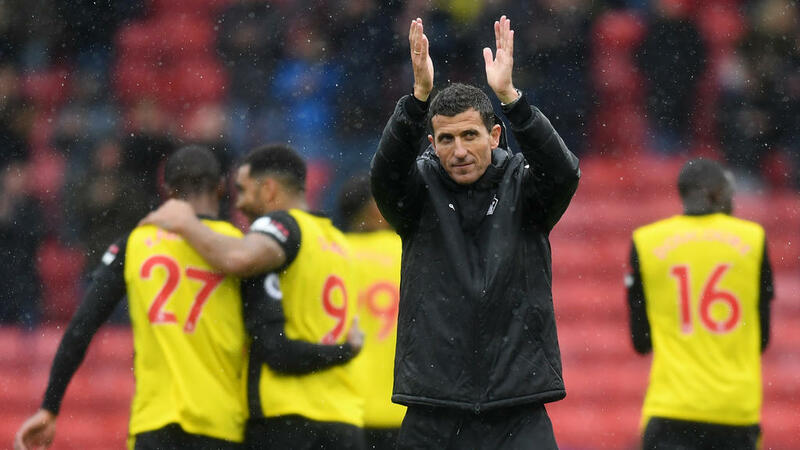 Four games into the new season, the top of the Premier League already has a familiar feel bar the presence of Javi Gracia's Watford nestled alongside Liverpool and Chelsea. Such a stunning start -- including the scalp of Tottenham in their last outing -- has some Watford fans dreaming of following Leicester's incredible march to the title in 2015/16. "I think we are in good form, we are enjoying it, but there will come a bad time when we'll have to suffer and that's fine," Gracia told AFP. "We are a humble team. We have big ambitions, big aspirations, but we know what league we are in. Over the course of the season, the competition will put us in our place. We know that winning the league is not our fight." Survival was secured, but a run of just one win in Watford's final nine games of the campaign did not hint at greater things to come, particularly when Brazilian international Richarlison was sold to Everton. "Perhaps we have a continuity that other teams don't have and that has been a strength for us," added Gracia. "That we have a base of British players I think is necessary," he said. "They have to be the foundations of the team, to show those that come from different countries what the Premier League is about. "I consider it important to have a base of home-grown players so that there is an identity with our fans, so that the players identify a bit more with them." The looming spectre of Brexit could threaten the Premier League's position as the most international of Europe's major leagues. "I'm not one for putting up barriers," said Gracia on the possibility of more restrictions on foreign players. But he believes one of his own players could provide the solution to England's need for a midfield playmaker. "I'm sure that in the short-term he will be part of the England team," Gracia said. "For me he is a midfielder with great quality, great work ethic, very disciplined in his defensive work and in attack he can make the difference." "We know we have a chance at home because we have the fans behind us, because we are confident at the moment, but we will pay heavily for any sense of over-confidence against a team like United," added Gracia.